Whether you live where there is a distinct summer season or enjoy a warm, temperate climate year-round, there is no better place to stay cool or relax than the lakes, rivers and streams that dot the country. No matter how you get out on the water, be it fishing with a small outboard motor, relaxing in a canoe or kayak or pleasure cruising in a speedboat or yacht, the two most important factors to enjoying your time on the water are comfort and security. And with their custom boat cushions, mattresses and safety pads, The Foam Factory makes spending time on your boat a breeze. As a custom foam manufacturer and retailer, The Foam Factory specializes in the production of mattresses, cushions and other support products. This also applies to products outside of the home, as their manufacturing capabilities and broad product line makes them the perfect solution to your marine cushion and comfort needs. Constructed of resilient closed-cell foam that will not absorb or retain moisture, The Foam Factory’s marine comfort products stand up to the environment without ripping, rotting or degrading for years of consistent performance. Soft and flexible neoprene is resistant to the Ozone, sunlight, oxidation, many chemicals and petroleum derivatives and breakdown by water and air, making it an excellent outdoor or marine foam. Also used is gymnastic rubber, a very dense, space-saving foam that remains soft to the touch for comfortable yet supportive cushioning. In addition to closed-cell foams, The Foam Factory also offers specially formulated, open-cell Dryfast foam boat seat cushions that will last much longer under your boat upholstery than regular open-cell varieties. The large, interconnected cells quickly transfer water without retaining it and maintain a degree of airflow not present in other products, allowing it to dry quickly. It is also anti-microbial, suppressing the growth of mold, mildew and bacteria present in damp areas. These foam types can be custom cut to any size or shape for cushions and seat backs on your watercraft, be they for the captain’s chair, bench seating, a sun cushion on the bow or below deck in custom couches and seating nooks. A personalized boat mattress can also be made in a range of foam types, custom-cut and beveled to match the curvature of your vessel’s hull or V-berth. Also important is protection from sharp edges and hard surfaces on a boat. Whether in a dinghy or a 50 foot yacht, it is important to never take solid footing for granted. With the constant rocking, choppy water and unpredictable wakes from other boats, protecting yourself above and below deck should you lose your balance is a priority. The Foam Factory can make any type of custom boat pad from dense, closed-cell foam that takes up minimal space while reducing the dangers of counter edges, ceiling dips, door and window handles, railings and shelves. In addition to protecting you, foam pads can also help protect the boat from the damage of swinging doors, cupboards and hatches. 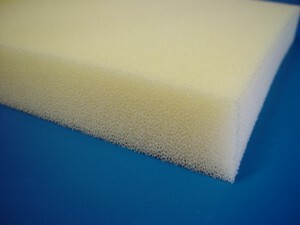 Smaller watercraft, like canoes or kayaks are also benefited by custom foam padding and cushions. After all, the more comfortable you are, the longer you can enjoy your boat! Closed-cell cross-linked polyethylene (XLPE) buoyancy foam has become very popular among kayaking enthusiasts, because of its low moisture permeability and flotation characteristics. It is soft and flexible, yet firm enough to provide the support needed to take you off hard plastic, aluminum or fiberglass boat seats. The Foam Factory has XLPE available in solid pieces up to 4 inches thick, making it an excellent product for molding non-sliding seat cushions to the bottom of the boat that will fit snugly and improve position and comfort. It is even able to be sanded for precision molding in tailored kayak seats. XLPE’s thinner sections are also great kayak foam as thigh, hip, back and foot padding, perfect for form-fitting your boat to your body, making it more maneuverable, comfortable and safer. Cross-linked polyethylene is also available in seven different colors to take the personalization of your boat even further. Regardless of your sailing schedule, whether you take time off or enjoy boating year-round, The Foam Factory can help outfit your boat to make each season more enjoyable and keep you on the water longer. Would you ship to Portugal? We can ship internationally. Please contact us for product and shipping prices. Hello, I have a aqua patio 220, 2005 that I would like to replace the sun deck area. Can you make it? If I provide the demensions, a picture too will help? Please contact us, we will need additional details before we could quote a price.